Retailers: Wholesale pricing is available for retail stores and for institutional or manufactured product use by recognized companies, schools, running clubs, race events, etc. Personal Use: If you would like to buy a small quantity of Squeezums Lace Locks for personal use and there is no retailer in your area click here. 50 and 100 pair lots. Packaged Squeezums available for Race Bags. Call for more info. New customers: PAYPAL Payment Below, then Net 30 for repeat orders. Paypal Payment is available for New Wholesale Customers. Or, for existing customers if you so choose. Terms Policy-Repeat orders from existing customers are extended Net 30 terms. If you are a repeat customer please use the online order form below. New Customers please click the Paypal button below. Squeezums Container-240 pair assorted colors. 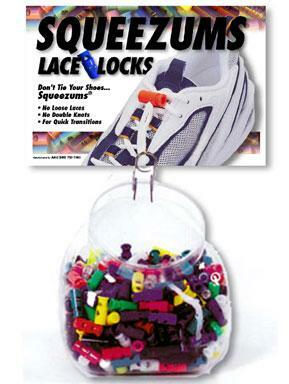 Two (2) Squeezums Containers-240 pair assorted colors X 2. Other products or quantities needed?